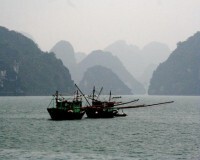 In the green-gray waters of the Gulf of Tonkin sit the more than 3000 limestone karsts that combine to form the wonder that is Halong Bay. 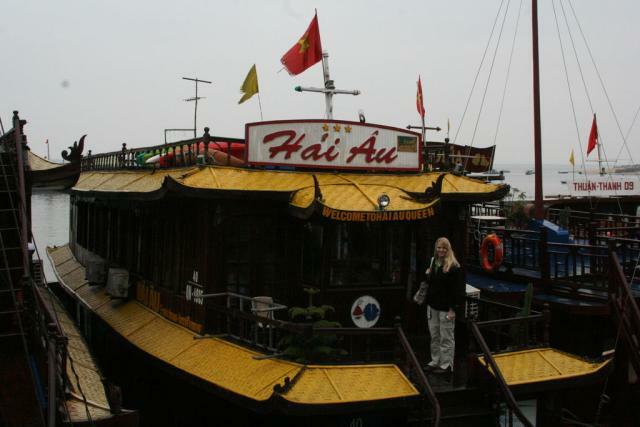 The bay has long been a draw for tourists visiting mainland Vietnam; most of us hop on buses in Hanoi and, after a long ride through rice fields and pastel, dollhouse-like homes, step aboard rickety boats (called “junks”) for some time on the open water. That’s exactly what Derek, Alyssa–my best friend who’s traveling with us for a few weeks–and I did a few days ago. Hurrying through the fine mist that has seemed ever-present during our stay in Vietnam, we boarded the Hai Au and set off to explore the karsts. The junk stopped at the three-chambered Hang Sung Sot cave, known to tourists as “Surprising Cave,” likely due to the, err, adult nature of one of the rock formations within. After exploring the cave, we braved the chilly air and paddled kayaks through a tunnel in one of the karsts and into an idyllic lagoon. Later, we warmed up over endless games of Uno, which is quickly becoming my favorite travel pastime. Our captain dropped anchor in the bay for the night, and we all fell asleep to the sound of waves lapping against the boat–not a bad lullaby at all!